I'll probably be able to talk about it more soon, but trust me, we made some impressive sounds...!! I'm filling my cheeks with all these Black Thunders I've got. 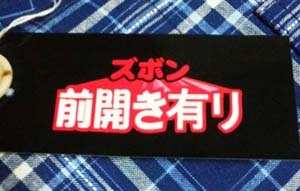 Along with the chocolate, I also bought this Baikinman phone strap. 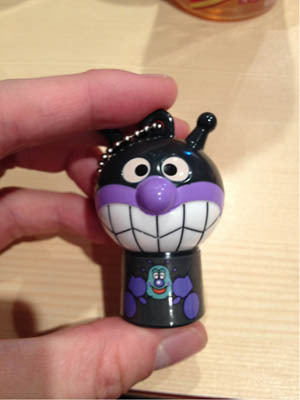 It appears to be part of a series of talking Anpanman mini-figurines. 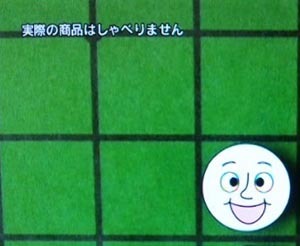 Apparently there's Shokupanman, Melonpanman, and the works as well. And when you press the switches on their backs, they shout "ANPUUUUUNCH!!" Or, you know, whatever their one-liner (finisher?) is. IT'S TIME FOR US TO SHOW OUR TRUE MIGHT!!! WHY ARE YOU ADMITTING DEFEAT UP FRONT. If you say that to your old nemesis Anpanman before a fight, ARE YOU NOT GOING TO LOSE HORRIBLY? Your target audience is three-year-olds. 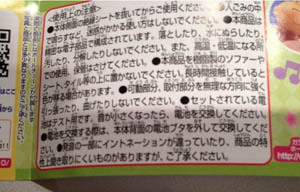 Are you expecting them to read this horrible mishmash of kanji, katakana, and hiragana...?!?!?!? Children's toys... are truly terrifying...!! "Please be aware that the intonation in the pronouncation may differ in places, making it difficult to discern the product's specific characteristics." Do you really have to warn people to THAT extent?!?!?! 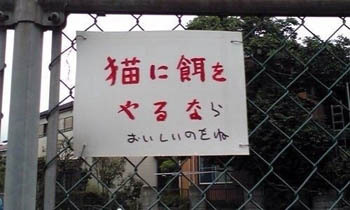 Japanese... is truly a deep language...!!!! "The real pieces do not speak"
"Don't feed the cats anything not tasty"